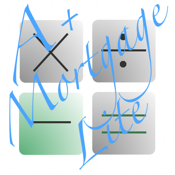 A+ Mortgage Calculator Lite offers 4 different loan calculators in one simple to use applications. In seconds, you will be calculating the monthly mortgage payment on your dream house, figuring out how expensive of a house you can really afford, determining mortgage refinance savings, or just calculating a simple amortization schedule for any loan. All calculators have a details screen which shows the full amortization schedule of the loan. Calculations are done instantly as soon as you type in updated numbers. This version is add supported. If you would prefer to not view any adds, purchase A+ Mortgage Calculator to remove the add banner.